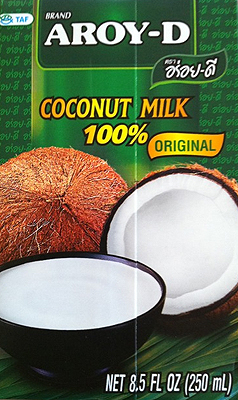 Coconut milk is the base of many Thai curries. To make the curry sauce, the coconut milk is first cooked over fairly high heat to break down the milk and cream and allow the oil to separate. The curry paste is then added, along with any other seasonings, meats, vegetables or garnishes. Depending on the brand and age of the milk itself, a thicker, more paste-like consistency floats to the top of the can, and is sometimes separated and used in recipes that require coconut cream rather than coconut milk. Shaking the can prior to opening will even it out to a creamy thickness. Although most of the fat in coconut milk is saturated fat, recent studies have shown that it is rich in medium-chain fatty acids (MCFAs), which the body processes differently than other saturated fats. MCFAs may help promote weight maintenance without raising cholesterol levels. So enjoy a bowl of rich and delicious Kaeng Kari Gai now.